In June 2018, the U.S. Supreme Court issued a ruling in the case Masterpiece Cakeshop vs. Colorado Civil Rights Commission. The Court’s ruling was narrow and reversed the original ruling by the Colorado Civil Rights Commission, in which the bakery was fined for violating the state’s nondiscrimination law. Why? Because the Supreme Court concluded that the commission had not acted impartially when originally considering the case. These guides provide an overview of the case including background, frequently asked questions and topline messages to facilitate conversations about the case and similar cases about service refusals. These guides were released in conjunction with the Open To All campaign. Movement Advancement Project. June 2018. 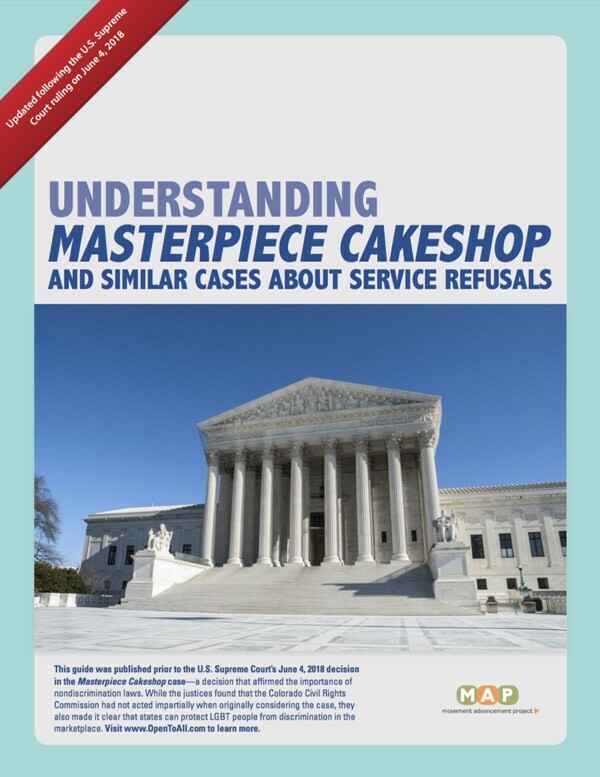 "Understanding Masterpiece Cakeshop and Similar Cases About Service Refusals." http://www.lgbtmap.org/understanding-masterpiece-cakeshop-case (date of access). Movement Advancement Project. November 2017. "Understanding Masterpiece Cakeshop vs. Colorado Civil Rights Commission." http://www.lgbtmap.org/understanding-masterpiece-cakeshop-case (date of access).